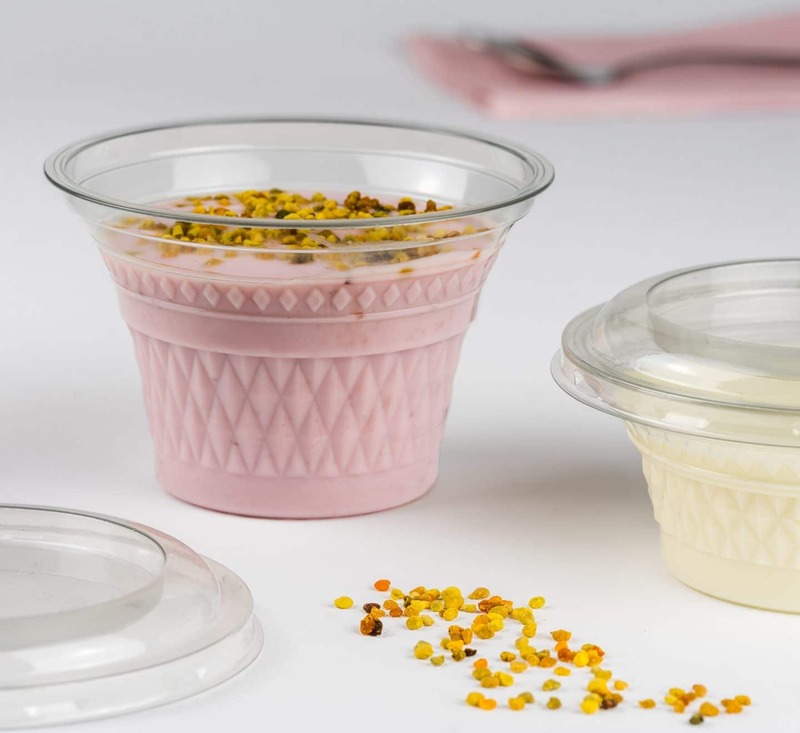 Bunzl Catering Supplies has launched an attractive new Diamond pot, from supplier Faerch Plast, made from 90 per cent rPET (recycled PET). Made in a manufacturing operation that uses only renewable energy sources, the new Diamond pot is fully recyclable where facilities exist, and because of its high recycled content, is likely to be exempt from the proposed HMRC Plastics Tax. Made in the United Kingdom in an operation using renewable energy from water, wind and solar, the new Diamond pot is available as a 4oz pot (small) and a 6oz pot (medium) with a single lid that fits both sizes. A high clarity pot with an attractive diamond pattern, the Diamond pot is ideal for presenting a wide variety of appetising cold food dishes, from stuffed olives to strawberry mouse. For operators wishing to label their dishes with product information, including possible allergenic ingredients, Bunzl Catering Supplies has paired the Diamond pot with a circular food packaging label from its Label 2 Go range. A perfect fit for the Diamond pot lid, available in silver or plain white, with a simple black border, these labels can be overprinted with food product information via Bunzl Catering Supplies’ exclusive Caterlabel service from Label 2 Go. In 2018, we adopted the United Nations Sustainable Development Goals (SDGs) as our roadmap for action. The SDGs underpin our Sustainable Future programme and environmental targets for 2020. Introducing products with high recycled content forms part of our strategy for delivering SDG Goal 12 Target 3: By 2030, substantially reduce waste generation through prevention, reduction, recycling and reuse. For more information about the new Diamond pot and lid, the Label 2 Go food packaging label service or our Sustainable Future programme, please contact Bunzl Catering Supplies today.